This is a sponsored post written by me on behalf of Smithfield® Marinated Fresh Pork. vinaigrette to create a hearty summer salad that the whole family will love! Summer has finally arrived and you know what that means...it's grilling season! Most summer evenings you can find me on my back deck, cooking on the grill, enjoying an icy beverage, and eating my dinner at my outdoor table. Since warm weather season isn't around too long in Michigan I try to enjoy every single moment that I can outside. Grilling just happens to be one of my favorite activities and I can proudly say that, after years of practice, I am Queen of the Grill! One reason I love to grill is that there is less mess in the kitchen. If I can throw my meats and veggies on the grill, there is no need for extra pots and pans in the house! Another plus is that it's quick, and you don't need to think too hard about what's for dinner. I try to keep a lot of meats and fresh veggies on hand so that I can pull together a quick grilled meal in no time. Something I keep in the fridge at all times is Smithfield Marinated Fresh Pork. They have different cuts as well as several marinade options, so the recipe ideas are endless. They do the work for you so you can have a hassle-free, delicious dinner any night of the week. Simply grill and you’ve got a delicious dinner ready in minutes! It's Real Flavor, Real Fast! 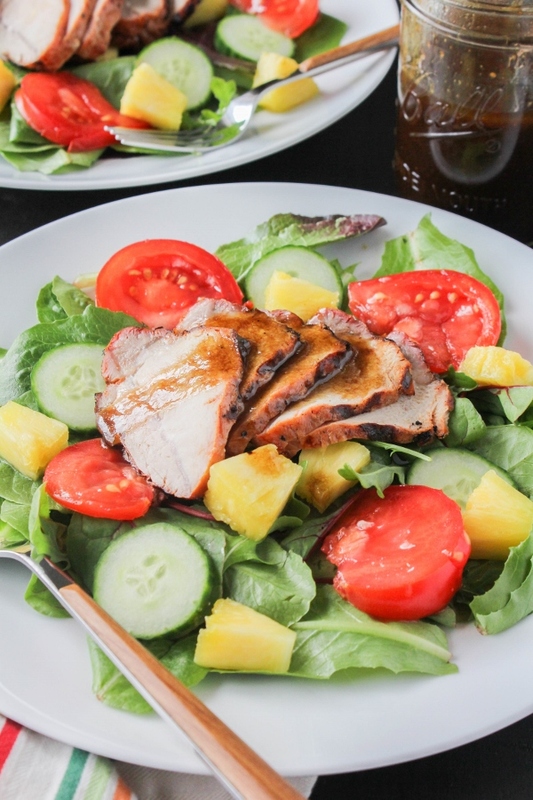 I was recently shopping at Kroger and picked up the Smithfield Marinated Slow Smoked Mesquite Flavor Fresh Pork Loin Filet for dinner and decided to make a fresh and delicious salad with it. 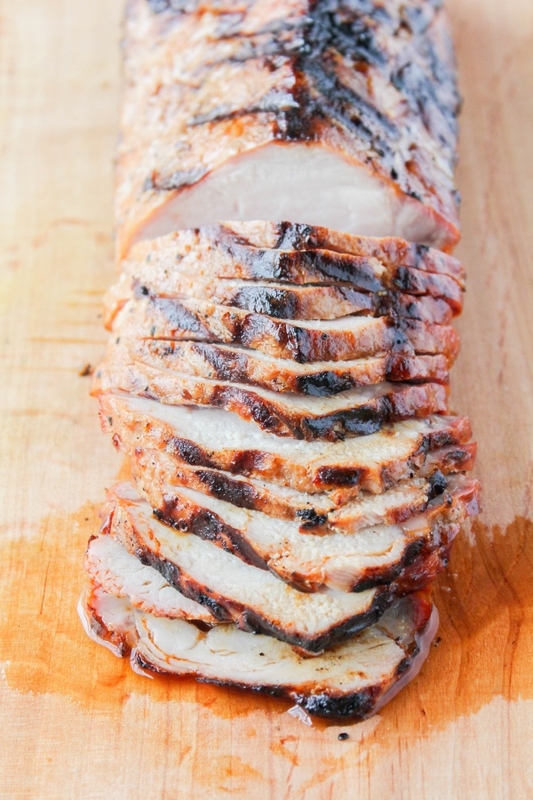 The pork is so tender and juicy and full of sweet and smoky flavor. Combined with fresh pineapple and heirloom tomatoes and topped with a simple vinaigrette, this salad was quickly gobbled up by my family. 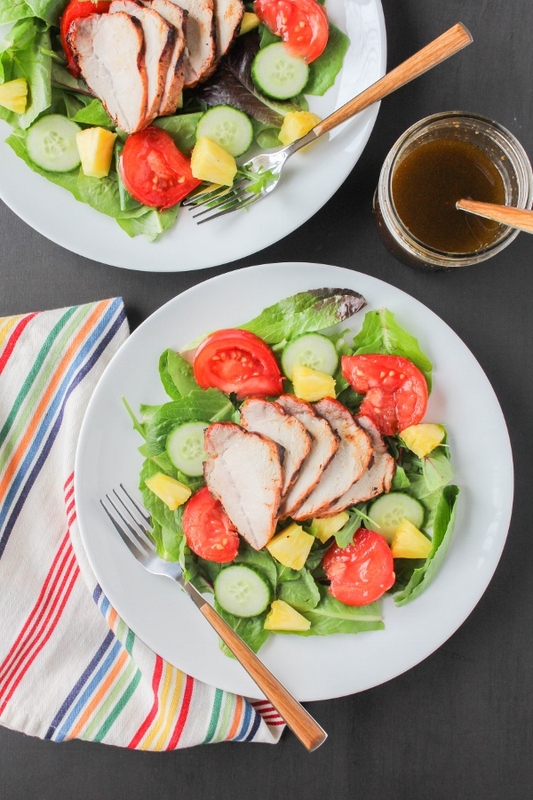 The pork loin only takes about 20 minutes to grill, and while it's cooking you prep the rest of the salad ingredients. 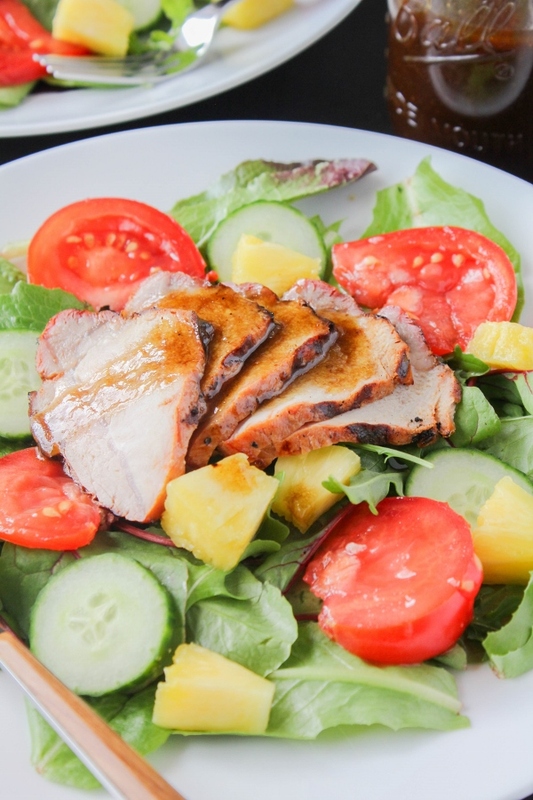 After allowing the pork to rest for a few minutes, it gets sliced up and added to the salad. Top it with a drizzle of dressing and dinner is served! I did have some leftover slices of pork and I used them the next day to make sliders. A slice of pork on a slider bun or roll topped with a little honey mustard is the bomb! 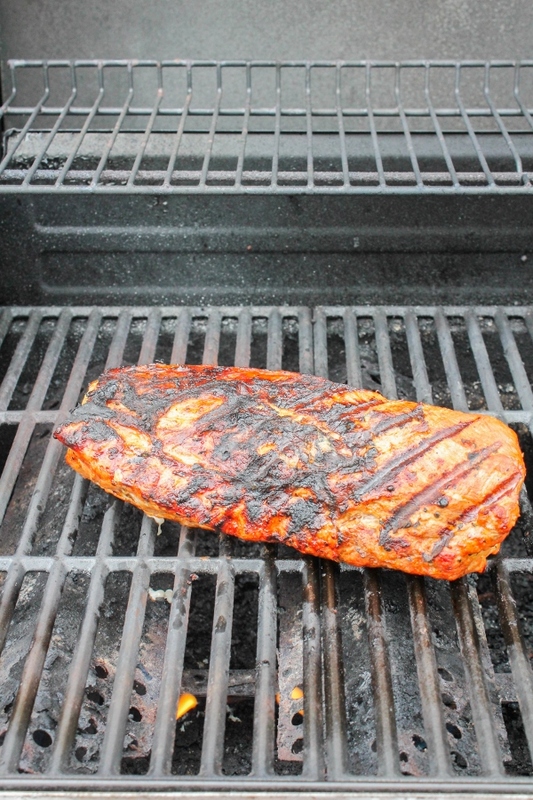 Kroger carries a great selection of Smithfield Marinated Fresh Pork to keep on hand all summer long for grilling season. 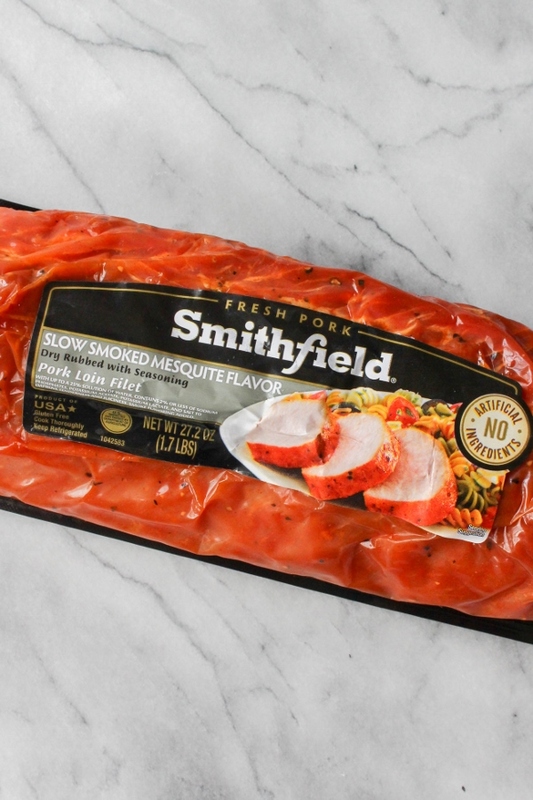 Plus, you can save $1 on one Smithfield product with this coupon! Are you ready to get grilling? Remove the pork from the refrigerator and let is stand at room temperature for 15 minutes. To make the dressing, add the olive oil, vinegar, honey, mustard, salt, and pepper to a glass jar with a tight fitting lid. Close the lid tightly and shake vigorously until combined. Preheat the grill to medium-high heat, between 350 and 400 degrees. Grill the pork, covered with the lid, 10 to 12 minutes on each side, or until a meat thermometer inserted in thickest piece of the pork registers 145 degrees. Remove the pork from grill, loosely tent with foil and let stand for 10 minutes. Thinly slice the pork. 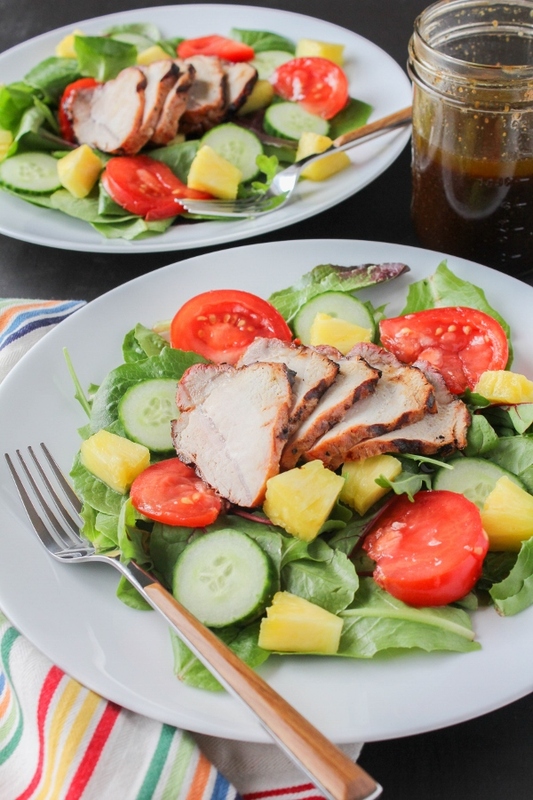 Divide the lettuce among four plates, then top with the pineapple, tomato, and cucumber, followed by slices of the pork. Drizzle the dressing over the salad.